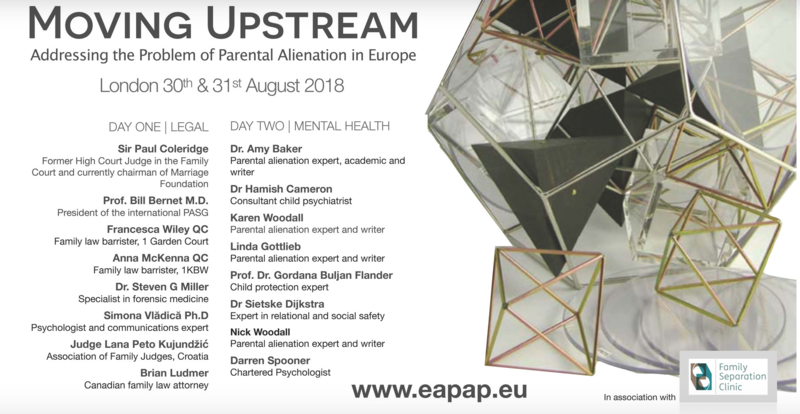 The EAPAP conference is starting to look like a game changer in the UK and Europe with key people in legal and mental health heading to London on August 30/31st to discuss and debate the issues involved in understanding and working with children who resist or refuse a relationship with a once loved parent. From North America we have Dr Amy J.L. Baker, one of the most well known researcher in the field around the world, along with Dr Steve Miller and Linda Gottlieb who will share with us their most up to date experiences of working with the problem of parental alienation. For anyone who has not seen these three experts discussing their work, this conference is an ideal opportunity to immerse yourself in their expertise. Professor William Bernet who is the head of the worldwide Parental Alienation Studies Group will share with conference the scientific evidence from his and other research in this arena. Brian Ludmer from Canada will outline his work in this field and his success in managing the legal aspect of case management. Not to be left behind, the UK offers significant expertise in Clinical Psychology and in the very best legal management of such cases from Darren Spooner of the St Giles Clinic and from Fran Wiley QC of 1 Garden Court and Anna McKenna QC from 1KBW. Dr Hamish Cameron, who is a pioneer in this field will share his knowledge and skill which stretches back many years. From Europe we have key expertise from Dr Simona Vladica from Romania where PA has been criminalised and Professor Gordana Buhjlan Flander from the Child Protection Centre of Zagreb on the issue of PA as child abuse. On the evening of day one we will be showing a special screening of the film Resilience about adverse childhood experiences and hosting a panel debate with key people in the legal and mental health arena. The aim of the conference is to bring to Europe an opportunity to learn, share and grow new practice and understanding of how to manage these very complex cases. The conference launches the European Association of Parental Alienation Practitioners, which will be open to all who wish to train and practice in this field. Sir Paul Coleridge, a powerful advocate for strong case management in the legal arena, will open the conference and each presentation throughout each day will be followed by a question and answer session allowing for maximum development of knowledge and sharing of thoughts and information. The Cavendish Centre in Central London is a comfortable conference space and delegates will have the opportunity to browse events tables with resources, books and information from services available to parents and families. Lunch and refreshments are provided throughout what will be an intensive day. Bookings are open now and places are limited to 150 each day and it is clear that there is much interest in this landmark conference, early booking is therefore now recommended. This is primarily a conference for professionals working in this field, however, a limited number of reduced price tickets will be available closer to August for parents as we know that many will wish to see key researchers and practitioners to hear about the latest work being done in the field. We have reserved a number of tickets for parents and we will alert you when those tickets are going to be on sale.